Flauguissimo Duo Master Class & Recital "A Salon Opera"
Flauguissimo Duo Recital "English & French Gardens"
"Couperin 350th Anniversary & His French Contemporaries"
Flauguissimo Duo Recital "The English and French Gardens"
Flauguissimo Duo Rectial "The Marriage of the Northern Star"
Flauguissimo Ensemble Concert "North & South"
"The Marriage of the Northern Star"
Flauguissimo Ensemble Concert "Les goûts réunis"
Music by Charlotte Bray, Sam Cave, Young-Shen Hsiao and Daniel Linker. St Michael at the North Gate, Cornmarket, Oxford, OX1 3EY. T.A. Arne, J. Oswald and M. Giuliani. Flauguissimo Duo Recital "Twitters and Twirls"
Music by de Visee, Blavet, Hotetterre and Kapsberger. Flauguissimo Duo Recital "Jane Austen's Music Room"
Gödestadsvägen 2, 432 33 Varberg, Sweden. Flauguissimo Duo "Dances of Baroque"
Flauguissimo Duo Recital "A Dream of Songs and Dances"
Flauguissimo Duo Recital "A Salon Opera"
"A Dream of Songs and Dances"
Opera seria "Dimitrio" by Johann Adolph Hasse (1699-1783). Libretto by Pietro Metastasio. Ensemble de Trianon "La Musique au Château de Bellevue"
Music by Blavet, Leclair and Kapsberger. Music by Fasch, Telemann, Lully and Purcell. Concerto soloists along with Mathew Tuscot. Flauguissimo Duo Recital "A Nightingale in the Salon"
with reading of "Ode to a Nightingale" by Keats. St John’s Church, St John’s Road, Harpenden, AL5 1DJ. Flauguissimo Duo Recital: Listen. Play. Create. Combining with Augustin Wiedemann's guitar recital. 24 July 7.30pm, IGF Guitar Summit, Kings Place, London. Combining with David Russell's guitar recital. Music of the Square: "To the Roses"
Music by Telemann, Blavet, Guignon and Zuccaro. "A Nightingale in the Salon"
Music by Paganini, Mertz, Schubert, Gluck and Piazzolla. Music by Monteverdi, Blavet and Morel. Music by de Visee, Blavet, Gluck and Mertz. Flauguissimo Duo Recital: "To The Roses"
Ensemble Les Nations Réunies chamber concert: "Nomen est omen"
A programme pays tribute to the ensemble’s name and includes works by François Couperin’s collections Les Nations and Les Gouts-réünies. Ensemble Les Nations Réunies chamber concert: "Never Ending Buzz"
who have either been to or lived in London, the most buzzing city in the 18th century and now. Les Nations Réunies chamber concert "Carl Philip and his father"
Ensemble de Trianon: "Life is Drama so is Death"
Baroque flute and theorbo duo recital. Muisc by Hotteterre, De Visee, CPE Bach and Telemann. Ensemble de Trianon: Flute and Harpsichord Duo Recital: "Like Father like Son"
Intriguing lines of the obbligato harpsichord and flute sonatas by the Bach family as well as the flute sonata from Tafelmusik by Telemann, the godfather of CPE Bach. This programme commemorates Handel as a composer of opera, chamber and solo works, and as a dedicated teacher to the daughters of George II, celebrating the popular appeal of his music during his lifetime. This concert is part of Hanover Rules! celebrating the 300th Anniversary of the Hanoverian Succession. Flauguissimo Duo Recital "A Nightingale in a Salon"
Music by Giuliani, Paganini, Mertz, Schubert and Prince Albert of Saxe-Coburg and Gotha. CPE Bach flute concerto in d minor & Kraus Sinfonia in c# minor. This programme brings to life popular operatic music heard in London during the Christmas season. 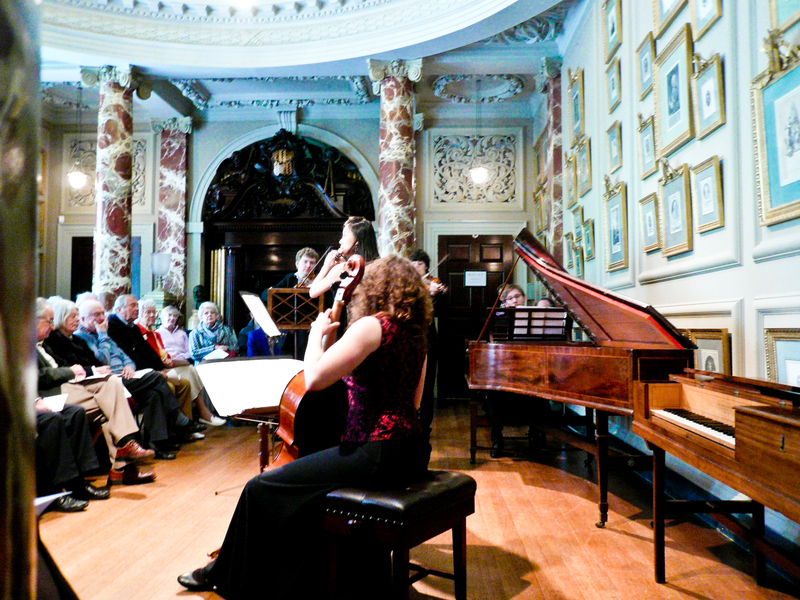 Works will be presented by Handel, Ariosti, Porpora, and Veracini from operas offered through-out the 1720’s & 1730’s. Kings Place, 90 York Way, London N1 9AG. Lamb House, Cuckfield Road, Hurstpierpoint. Ticket at door. Full price £10/concession £8. Ballo Baroque Ensemble: "Baroque Resurrected"
Ensemble de Trianon Chamber Concert: "Baroque Quartets"
With Elin White, George Ross and Marie van Rhijn. Town Hall, Sheep Street, Stratford on Avon.